Club Penguin Cheats by Mimo777 Club Penguin Cheats by Mimo777: Club Penguin Field Op Number 38 Cheats! mimo I have a very important message! 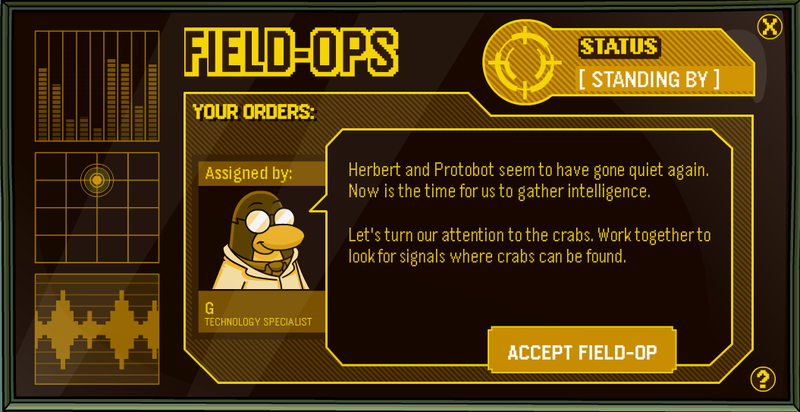 If you go to the EPF command room and wait there will be a message that pops up on the screen of the giant TV. There will be lots of printing you cant see. Then there will be pictures with three rooms: The beach , the cove, and the everyday phoning facility. The EPF room will have the regular door, but a secret EPF door will pop up in the beach and the cove! This could mean that there are secret doors. Lots of us tried to find it but I think its just a warning or something. Then the message will zoom out and there will be a map with dots. I think its club penguin, but there were more than three dots so I think there are more secret door rooms! This could relate to something! wow...rookie is the comm lead? When I look at my hints for my box scavenger hunt, I get the hints for the halloween one! How come Rookie could translate crab language during the Klutzy System Defender Level and he couldn't right now? Hey Mimo! Sorry this is in the wrong place but I wanted to show you this as fast as I could! Go on Club Penguin, wear ONLY the Boz and the Purple Propeller Hat and dance! A glitch will happen! Try to do this before CP finds it! Hey mimo I found a cool glitch! Put the box costume and the purple propeller hat together, and then dance! Hehe, the hat starts flying without your penguins head! Well isnt 36% an odd figure Rookie? WOah! Rookie is the comm. leader cool congrats for promotion. 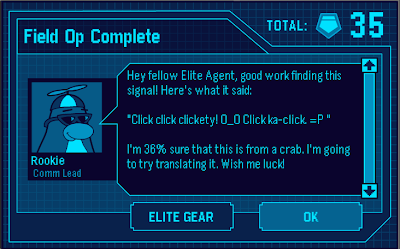 I see our roles reducing as EPF agents. everything happens and gets over and then we are reported about it. In the missions we were the ones who made things happen. But now its all Behind The Scenes. We just complete Field Ops which don't actually move the story ahead. I tried this glitch today! It's a great glitch! have you noticed the glitch with the face paint? basically, if you put on face paint then on your player card it will be really shrunk down and is on your nose! When you wear the box you turn into a box. BUT, if you also wear the propeller hat and dance, you turn into a box AND the hat floats above the box by itself! nah Im not new. I havent been on in like weeks. Im not new, either I've been here since 2007. Plus, didnt you hear that mimo said only ten mods were to be chosen? The 'new mod' thing stopped months ago. I hate the last Field Op, but amazingly, I passed it! Hey Ethanator, I remember you. But that was like years ago. Just kidding. Mimo, Rookie is way easy to find! Foubd him 3 times already! I am glad to say congrads to Rookie for the poromotion! And i wanted to say that the is a glitch on cp. When you go to your items, if you look at how many you have, it goes into NEGATIVE numbers! They give you more items than you acctually do! I baught 2 chairs and now i have 46!!! i did NOT buy them!!! If you have a box dimension portal in your igloo you can only use it once. If the room is full you can't waddle over it again until you leave and re-enter. But if you have a puffle launch cannon you can load the game and then the box dimension portal will work again. Today, I was about to play the new Club Penguin game, Bits and Bolts when I saw another arcade game next to. It’s not plugged in and no game is shown on the screen.I realized that this could be for a new game coming soon! It will definitely be an arcade game if there is a new game. Weird, don't you think? Good spotting! I noticed this yesterday when I was trying to get to the Box Dimension from my Igloo when the room was full.